I hate it when a good app goes bad, and that’s just what happened to me a couple of times now with OneNote 2013.Â If you’ve been using OneNote (or ON as I like to call it – gotta have that abbreviation) then you know what a great app it is.Â Â A number of months ago OneNote would crash within ten seconds of starting up.Â I found the resolution to it and moved on. Note: Most likely you will need to turn on view hidden files because AppData is a hidden folder. 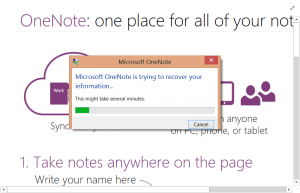 Restart OneNote.Â When OneNote starts you will only see placeholders for your folders.Â Don’t worry, just give it some time and let OneNote build the cache and then you should see everything. You can find another thread on the topic on the Microsoft Community.